No-one knows why the Blue Crow comes, or why it chooses those that it chooses. In some cultures, to see the crow is considered an honour. The people of Billion Toad City, who know a great deal about life-changing events, think of it that way. In other places, those who see the crow are to be pitied. In the lands conquered by Urizen, to speak of the Blue Crow is a crime, and those who do are declared mad and locked up. It would be too easy to say that the people of Billion Toad City, wise as they may be, are right in their view. There is truth to the other views as well – even to that imposed by Urizen. There is something of madness in those who have seen the crow, and perhaps we should pity them. And so it is. 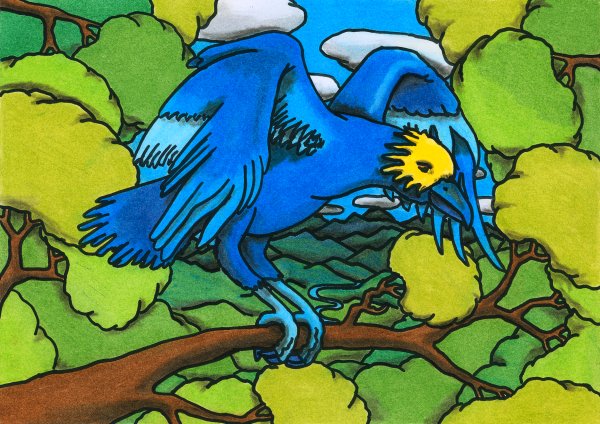 All who see the Blue Crow are compelled to begin a journey. The journey is always hard, the destination always magnificent. But despite the songs sung in Billion Toad City, the journey is not always a blessing. A vision may burn in the traveller’s mind, but not everyone gets there. Sometimes the road fails us; sometimes we fail ourselves. And perhaps the difficult truth is that some destinations cannot be reached, no matter how much we yearn for them. The Blue Crow has brought glory and wisdom to many, but too often we forget that the roads it asks us to travel are covered in bones. What could be is not always what will be. Perhaps Urizen is right in this one matter. Is there not more to life than visions? Are there not joys to be found that do not require glory or transcendence? So many walk those roads, so many fall. It is not unreasonable to stay by the fire. It is not unreasonable to turn away from the winged messenger. Ah, but who can deny the dreams that it brings? This entry in the Oneiropolis Compendium was made possible by Dan Stubbs.